I started this post around 2 o'clock this afternoon and then 10pm here I am again. Monday I know. Monday has such a bad reputation but it always lives up to it. I am so very glad to be home but I am so far from being in bed it is just unbelievable. At the moment I am trying to pack for tomorrow but I cannot do that until I get done with the laundry. I had forgotten about the 2 sports bras 2 workouts a day problem. I have everything going I just want it to finish. Then I started to cook some chicken for the week and had to defrost....still Monday!!! So while the chicken is grilling I'm gonna try to post. I did get in a workout tonight that I have not done in weeks. 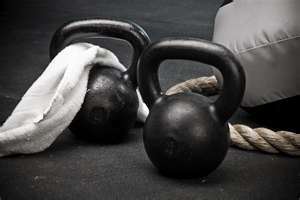 I was invited back to the kettlebell workout. I enjoyed this last time but could not justify paying two separate memberships so I just decided I would have to do something else. But when my workout buddy said to come by tonight I just couldn't resist. I cannot wait to see how this body is going to feel tomorrow because I have truly beat it up over the last few days. It hurts but if I am gonna get this weight back off then I am gonna have to hurt a little bit. I was already sore from Saturday's workout. Sore is an understatement. I can feel every single step I take. And then tonight's workout is not going to help anything. We did 400 swings. I thought I held my own for not having done it in so long. When it was over my back was starting to hurt and I thought I had made a bad decision but after we stretched the back was fine. But as I walk around the house and I feel Saturday's workout and tonight's workout I can tell tomorrow is going to be fun. I failed to convince my workout buddy to do the 99 workout I think I'm just gonna have to do it all by my lonesome. There is no telling how long it will take but I will do it til I have to leave for work.